Besides all my usual reasons, I have been very tardy in posting recently because of a whirlwind trip to the Philippines. The premise was a sad one, as a dear, dear loved one has passed, but the result was gathering together with family at our ancestral home just outside of Manila in Cavite. And as I learned during my first Filipino wake, times of Filipino mourning are just as filled with food as times of celebration. The food in this house has been prepared by a woman named Rita who has worked for the family for as long as many of us can remember--at least the last twenty years. She is a masterful cook and she was in top form for the entire week, whipping up meal after elaborate meal for dozens of hungry neighbors, distant cousins and travel-weary visitors at a time. I always started by getting my hands on some quesillo (which I saw spelled Kaysilo at a local market). Quesillo is Cavite's version of Kesong Puti. It is a fresh, unpasturized and glorious cheese made from the milk of a carabao. 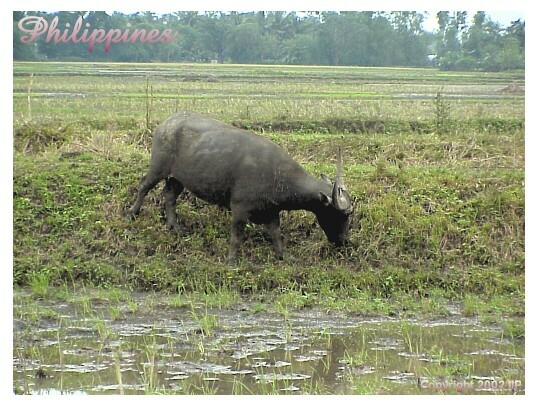 The carabao, if you don't know is the Asian Water Buffalo and native to Southeast Asia. It is an enormous and cumbersome beast while the cheese, in contrast, is delicate and light. It is just firm enough to stay together when sliding out of the banana leaf in which it is wrapped, but soft enough to fall apart with the gentle tug of a spoon. Its creamy texture and fresh taste make it the perfect spread for a freshly baked pandesal (the Filipino salty bread roll) though it is even better with a bite of a sweet, sticky longganisa sausage dripping with fat. Also on that plate above with both a sweet and a garlic-laden longganisa is a subtly sweet tube of sticky rice, Sumang Malagkit. It too came wrapped in a banana leaf. And another version of it was flavored (and colored) with ube, the ubiquitous purple tuber of the Philippines. Everything is better with ube. Despite how I talked up Rita at the beginning of the post, in retrospect much of this particular meal was bought at the local market. But just so it's clear that she is an awesome cook (press "1"), here is a picture of lunch later in the week. Her version of Arroz a la Cubana. This Latin-inspired Filipino dish consists of ground pork, peas, carrots, potatoes and raisins all mixed up in a red sweet-but-savory tomato sauce. That sounds good enough as is, but also thrown in there are big chunks of fried banana--Saba to be specific. Saba is a small cooking banana with a taste not unlike a plantain, though it is sweeter. The dish is typically served with a fried egg, but Rita--who was cooking buffet-style and had no time to be frying eggs to order--instead hard-boiled quail eggs and tossed them in with everything else. Brilliant. That is a taste (or at least a look) of what I've been up to lately. It's too bad Denver doesn't have Filipino food this good but then again the Philippilines doesn't have good Greek or Salvadorean cuisine either--just two of the themes of upcoming posts I'm working on now-- if I can just find the time to get it all done. Those foods are my favorite. I just want to share my favorite longanisa you can found it in Ilocos Norte. I want to experience the Philippines cuisine! Unfortunately i'm on the other side of the planet where no one knows how to prepare it :( Must move to a multicultural food hub!